CROOKS, RAMSAY, fur trader; b. 2 Jan. 1787 in Greenock, Scotland, son of William Crooks, a shoemaker, and Margaret Ramsay; m. 10 March 1825 Marianne Pelagie Emilie Pratte, and they had five sons and four daughters; d. 6 June 1859 in New York City. Ramsay Crooks immigrated to the Canadas in 1803 with his widowed mother and some siblings; two of his brothers, including the eldest, James, and a half-brother had come to Upper Canada in the previous decade. Upon his arrival he was briefly employed by a Montreal mercantile firm before going west to Michilimackinac (Mackinac Island, Mich.) as a clerk for fur trader Robert Dickson*. The formative period of his career, between 1805 and 1810, was spent on the Missouri River “learning the arduous routines, picayune details, and ruthless rivalries” of the trade. He wintered on the Missouri River for Robert Dickson and Company in 1805–6 and 1806–7. After an unsuccessful partnership with Robert McClellan (McLellan), trading on the Upper Missouri, Crooks was persuaded by Wilson Price Hunt to join the overland expedition to the mouth of the Columbia River proposed by John Jacob Astor of the American Fur Company. On 23 June 1810, together with Astor, Duncan McDougall*, Donald McKenzie, Alexander MacKay*, Hunt, and others, he became a founding partner in the Pacific Fur Company. During the overland journey, which began shortly afterwards, Crooks was forced by illness to remain behind in the Oregon country while the rest of the expedition continued on, and he finally reached Astoria (Oreg.) in May 1812. A few days later, exhausted by the demands of the expedition, he relinquished his interest in the PFC. On his return journey from Astoria, he crossed South Pass (Wyo. ), one of the first white men to do so. Evidently impressed by the young man’s capabilities, in 1813 Astor offered Crooks a one-third interest in a venture in the Michilimackinac area, then under British control, to secure furs belonging to the South West Fur Company, a firm formed in 1811 by Astor’s American Fur Company and the North West Company [see William McGillivray*]. Using Michilimackinac as his base of operations, Crooks travelled extensively during the next five years, gradually assuming more responsibility for the AFC concerns around the Great Lakes. 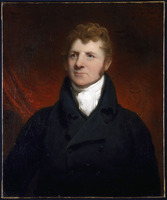 He became one of the company’s principal agents in 1817 after Astor purchased the NWC’s interest in the South West Fur Company. Astor’s confidence in such a young and relatively inexperienced man testifies to Crooks’s natural aptitude for commerce, his managerial ability, his honesty, and his reliability. With Astor often abroad, Crooks assumed leadership in directing the affairs of the AFC, spearheading a policy of expansion into the west. In 1827 he secured a partnership with Bernard Pratte and Company of St Louis (headed by his father-in-law), which meant equal shares for both companies in the trade on the Mississippi River below Prairie du Chien (Wis.) and along the Missouri River. 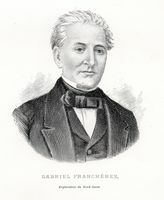 In the same year he also directed a consolidation with the Columbia Fur Company, active around the Great Lakes, the Mississippi, and especially the upper Missouri. According to the new agreements, Bernard Pratte and Company assumed control of the AFC’s Western Department, and the AFC’s newly created sub-department, the Upper Missouri outfit, was directed by former Columbia Fur Company employees. Wherever possible, Crooks favoured absorbing rivals or coming to terms with them rather than competing. “I prefer peace,” he wrote in 1828, “if to be obtained on equitable terms.” He took out naturalization papers in 1830. A prolific writer, Crooks left voluminous correspondence which reveals his kindly personality and the reasons for his success. Plagued by chronic ill health, he never spared himself in attending to his responsibilities. He was an unusually gentle person, and the only faults he ever found in others were indolence, inefficiency, and impertinence. Through his daily correspondence, he was informed of the current prices of furs in Europe and of the minute details of conditions at remote posts. A master of the pen, with it he endeavoured to win political favours for the company and its employees. He was both tactful and precise, earning the respect and friendship of his associates. Minn. Hist. Soc. (St Paul), Biog. file, Ramsay Crooks and family. Mo. Hist. Soc. (St Louis), Chouteau coll., American Fur Company letter-books, 1 (1816–20); letters of Ramsay Crooks, John Jacob Astor, and the American Fur Company, 1813–1846 (typescript, 1918); miscellaneous letters of Ramsay Crooks. DAB. A. T. Andreas, History of Chicago, from the earliest period to the present time (3v., Chicago, 1884–86), 1. H. L. Carter, “Ramsay Crooks,” The mountain men and the fur trade of the far west . . . , ed. L. R. Hafen (10v., Glendale, Calif., 1965–72), 9: 125–31. J. L. Clayton, “The American Fur Company” (phd thesis, Cornell Univ., Ithaca, N.Y., 1964). Washington Irving, Astoria; or, anecdotes of an enterprise beyond the Rocky Mountains (rev. ed., New York, 1882). D. [S.] Lavender, The fist in the wilderness (Garden City, N.Y., 1964); “Ramsay Crooks’s early ventures on the Missouri River: a series of conjectures,” Mo. Hist. Soc., Bull. (St Louis), 20 (1963–64): 91–106. G. L. Nute, “The papers of the American Fur Company: a brief estimate of their significance,” American Hist. Rev. (New York and London), 32 (1926–27): 519–38; “Wilderness Marthas,” Minn. Hist. (St Paul), 8 (1927): 247–59. J. W. Ruckman, “Ramsay Crooks and the fur trade of the northwest,” Minn. Hist., 7 (1926): 18–31. Tanis C. Thorne, “CROOKS, RAMSAY,” in Dictionary of Canadian Biography, vol. 8, University of Toronto/Université Laval, 2003–, accessed April 25, 2019, http://www.biographi.ca/en/bio/crooks_ramsay_8E.html.